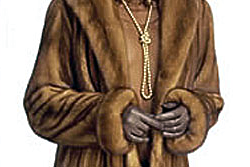 We received a claim to investigate the theft of an expensive fur coat from a residence in Beverly Hills. When the adjuster arrived at the insured’s residence, where the alleged theft had taken place, he was met by the insured who turned out to be an elderly lady. In her statement she related to the adjuster that the fur coat had been stolen from her closet in her upstairs bedroom. About half way through the interview the insured’s husband entered the room and asked who the adjuster was and why he was there. Upon learning the reason for our presence he immediately left the room. Not deterred by this somewhat strange behavior the adjuster continued the statement. About 5 minutes later the husband returned with an expensive looking fur coat draped over his arm. Upon seeing this elderly lady almost jumped out of her seat and said “Oy, oy, oy! Where did you find that?” to which her husband replied that it had been in the back of the closet all along. End of claim.